WooCommerce Bulk Stock Management Extension: adds a new interface to your products section which Easier stock management for large numbers of products with this user-friendly interface. Via the input field you can easily set the stock quantity for multiple products at once. There are bulk actions for setting the stock status too. ◉This nifty interface lets you filter products by type, Bulk Stock Management status and stock status as well as order your products by ID, name, SKU or stock quantity. 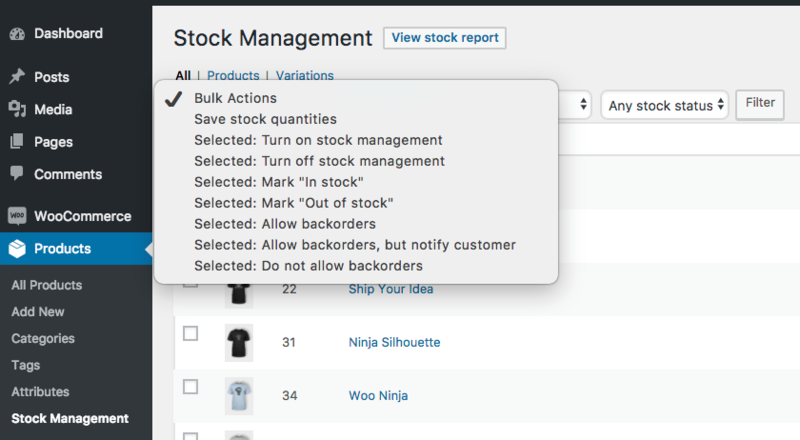 ◉Go to ‘Products’> ‘Bulk Stock Management’ in the WordPress admin menu to manage your stock with the WooCommerce Bulk Stock Management . ◉you can filter the products by Bulk Stock Management status, stock status and category. Order the products by name, ID, SKU or stock quantity. You can even use the the field to the right of each product to conveniently set the stock quantity.